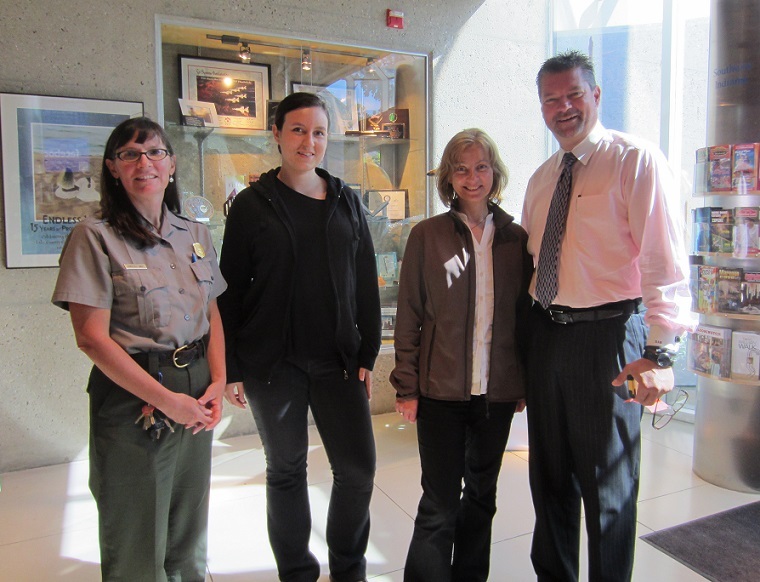 Ewa Siatecka, Kampinos National Park&apos;s specialist in tourism and international affairs, and Ma?gorzata Mickiewicz, deputy director for scientific research, monitoring, education, communication and tourism, spent three weeks visiting the Indiana Dunes National Lakeshore as part of a "sister park" program. According to Siatecka and Mickiewicz, the trip provided them the opportunity to experience the nature and witness the cooperation between associations and organizations that are working toward the same goals. Additionally, the visitors stated it was important for them to see how employees of the national park work, as well as act as tourists and see the park from that perspective. During the visit, Siatecka and Mickiewicz stopped into the Indiana Welcome Center to meet with Speros A. Batistatos, president and CEO of the South Shore Convention and Visitors Authority, to further learn about the South Shore. Batistatos explained to Siatecka and Mickiewicz the importance of cooperation with the various public and private partnerships that comprise the Dunes National Park Association as well as the various businesses that partner with the South Shore CVA. "When I started with the South Shore CVA in 1989, the organization was comprised of two people and had a budget of $172,000," said Batistatos. "Since then, we have grown significantly. We now have a professional staff of 18, numerous part-time employees and a $3.5 million budget. We achieved this through cooperation." Batistatos explained the importance of reaching out and developing partnerships with public and private groups as well as public relations efforts. "We have developed partnerships within Lake, Porter, LaPorte, Newton and Jasper Counties. Additionally, we have a partnership with the Chicago White Sox," said Batistatos. Batistatos urged Siatecka and Mickiewicz to work on the development of partnerships with those who would be the Kampinos National Park&apos;s biggest advocates as well as help the public understand the mission of the park. "You need to get people to understand the value of what you&apos;re doing. In order to change an elected official&apos;s opinion, they need to hear it from the people," stated Batistatos.